AKRacing Prime Series ▷ Size & Buying Guide on GOTURBACK.UK! Take the front seat with this racing style gaming chair. 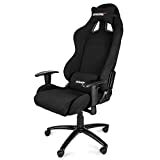 If you love car racing games and are looking for a gaming chair that looks super high performance and feels totally comfortable, this product from AKRacing could be a good option to explore. Cold moulding foam over a durable steel and aluminium frame make this chair both sturdy and supportive, with just enough softness to let you feel like you are sinking into a cosy armchair every time that you begin a gaming session. The ultra sturdy aluminium and steel frame of this chair is topped off with foam that has been carefully moulded to provide support for the entire length of the user’s spine and for their head and neck as well. A comfy fabric cover envelopes the whole chair, and cold foam battling is used to give extra support and cushioning where it is needed most – for instance, on the back rest. Lumbar and neck pillows are built into the back of the chair to give support during long periods of gaming. The arm rests, however, are not cushioned and they come in a 2D style. If you like to recline, you will find that you get 90-180 degrees of backwards recline with this chair, as well as a tilt of 12 degrees. Another important feature of this chair to bear in mind is its floor friendly design: its splayed 360 degrees five wheel roller has been fashioned so that it moves silently across the floor without leaving any scrape or scuff marks. The tilting and reclining mechanisms are also designed to be silent, without any annoying squeaks. The height is adjustable to 4 different positions using a gas lift, with the lever located beneath the seat. There are no accessories that come with this chair, which means that you can simply wheel it (silently of course) into your gaming room or to wherever you have your computer and start playing. It comes in a variety of different vibrant hues, all of them with a classic black base. Choose from orange, lime green, bright blue, or cherry red. The overall aesthetic of this chair is designed to emulate that of a racing car seat fused with a traditional gaming chair: the perfect mix for anyone who likes their games speedy and car based. This chair works best for gamers who weigh in at just under 80 kg and measure in at just under 1.8 metres. If you weigh less than 55 kg or more than 90 kg, it may be best to find a different chair. Likewise, if your height falls outside the 1.65-1.85 metre range, this chair may feel a little uncomfortable for you as (for example) the neck pillows, and lumbar supports may not be in the right positions. As mentioned above, you can use the lever beneath the seat to adjust the chair to the perfect height for your legs before you start to play.